Posted February 3rd, 2019 by Mike Boyes & filed under Uncategorized. 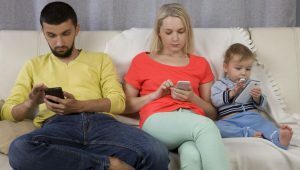 Description: You would have to have been under a non-internet enabled rock lately to have missed the rising tide of concern about the extent of smartphone use, social media use, and screen time in general. We though concern over television use was a big deal 30 to 40 years ago but that looks positively rural compared to today’s screen time concerns. So here is a simple (not really) question. What is it about screen time that we should be concerned about? The fact that screen time is associated with developmental delays is not to be taken lightly but is it going to be a simple thing like that which we eventually came to with television — that time spent watching TV was time spent not doing other things (that were better for you). So, what is it about screen time these days we should be worried about both for our children and for ourselves? Source: What we talk about when we talk about excessive screen time, Mark Kingwell, Opinion, Special to The Globe and Mail. And Study Links excessive screen time to developmental delays in children, Wency Leung, Health, The Globe and Mail. So, what are you thinking now about screen time? The second article linked above appropriately suggests a version of the “time away from stuff that is better for you developmentally” hypothesis and that makes a lot of sense. The task that remains, however, is the big one – figuring out just what is being under done developmentally due to screen time totals. The first article linked above is somewhat more speculative in nature, but it is looking directly at this question of what is being missed. The existential hypothesis being explored is potentially quite a rich one (in my humble opinion). When we are bored we turn to screens to interest and engage us and screens these days do that very very well. But what is the boredom we experience is actually ‘pseudo boredom’? Plain old boredom is what we experience when we have nothing to do other than the same old same old. Pseudo boredom is what we experience when a parent of our basic situation of the moment directly or essentially tells us to “find something to do.” THAT is an important existential developmental ‘what-are-you-going-to-DO-about-it’ moment. As the author of the second linked article puts it in closing … “ Screen or no screen, you are still an individual, for now. Maybe your looming boredom is worth exploring rather than feeling.” Think about that, with your brain and no screens. What is the relationship (possible) between screen time and development? How might screen time be an existential developmental issue? Maras, D., Flament, M. F., Murray, M., Buchholz, A., Henderson, K. A., Obeid, N., & Goldfield, G. S. (2015). Screen time is associated with depression and anxiety in Canadian youth. Preventive medicine, 73, 133-138.